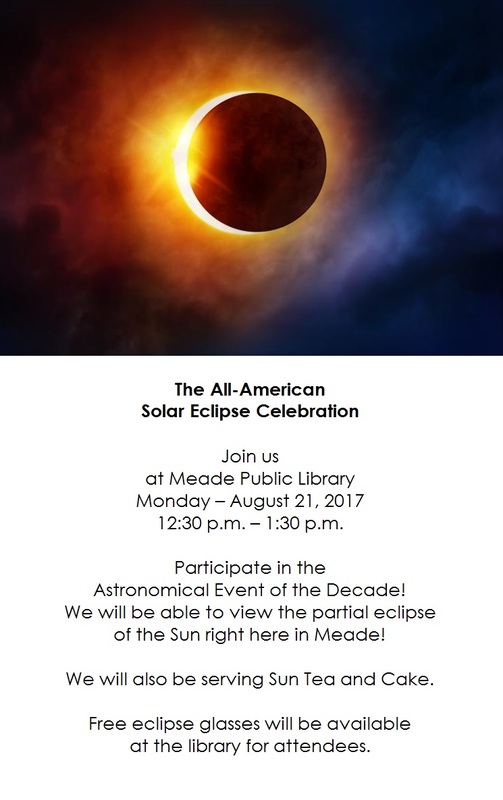 The Meade Historical Society Museum will be here with an antique model of the solar system which will demonstrate how an eclipse happens. We will have a live stream fro NASA as the eclipse happens across the country. We have fliers with information about eclipses, safe viewing, how to make a shoebox viewer, and more. The total eclipse is visible in the Northeast Kansas/Kansas City area at 1:09 p.m. Our best viewing will be during this time. Folding chairs will be available or bring your own lawn chairs and blankets for extended viewing.